More Products From Creative Corkworks - Put a Cork In It. It’s difficult to keep up with the product ideas coming from Raelene Rozander’s Creative Corkworks. Tired of pulling your favourite necklace from a tangled knot in your jewellery box? 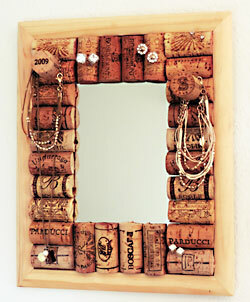 Perhaps you need the mirror with a cork surround that you can hang your necklace from and pin your ear studs into. Need to quickly pick your flash drive from the others in that tech-tangle on your desktop? The drive fitted into a hollowed out wine cork is easy to spot. Raelene’s products can be found in a few wineries and a campground in Summerland BC; the Penticton Wine & Tourism Center; and the Penticton Art Gallery. See Raelene’s creations on her Etsy page, or check out her Creative Corkworks facebook page.